Close to the Royal Gorge Bridge and the best river rafting in Colorado, our Canon City hotel provides a great location and spacious accommodations. Canon City, Colorado is known for the historic railroad route and great outdoors. Our Canon City hotel is the perfect destination for a picnic, hiking or to simply enjoy the surrounding beauty. Enjoy the outside scenery in the mountains, or spend the day exploring the charming town and shopping in the boutiques. Amenities in each room such as a microwave, refrigerator and 37-inch televisions make you feel right at home. The indoor pool, hot tub and sauna are the perfect place to relax. We are adjacent to many restaurants, so it is easy to walk to a different eatery for each meal. However, leave the most important meal of the day to us. Each guest is treated to a free hot breakfast with waffles, fresh fruits, yogurt, pastries, cereal, Arabica coffee and juices. If you are staying with us while working, you can count on clean, quiet rooms that are conducive to getting tasks completed. You will also be conveniently located next to everything you need, such as shopping and grabbing a quick meal. Management reserves the right to refuse to provide accommodation to persons less than 21 years of age unless accompanied by a parent. Identification is required at check-in. �From: North. Take Interstate 25 South. Exit on Nevada Avenue to Highway 115 in Colorado Springs and continue 40 miles. Exit on Highway 50 to Canon City and continue 11 miles. The Best Western Canon City is on your right on Latigo Lane. �From: South. Take Interstate 25 North. Exit on Highway 50 toward Canon City and continue 42 miles. The Best Western Canon City is on your right on Latigo Lane. �From: West. Take Highway 50 East. Continue through Canon City. The Best Western Canon City is on your left on Latigo Lane �From: East. Take Highway 50 West. Continue to Canon City. 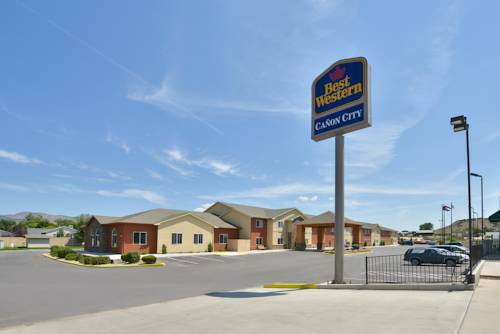 The Best Western Canon City is located on your right on Latigo Lane. 12.00 mile(s) from Antiques of Florence, visit the town of Florence 12 miles away for their variety of antique shopping and art galleries. 20.00 mile(s) from Bishop's Castle, the castle is being built by a local owner over the last 40 years. A work in progress. ~27 miles from Canon City. Cattle rancher Judy Messoline built a UFO Watchtower so that everyone could better see what flies over her land. ~59 miles from Canon City.